I just saw this and think it has a few uses if it works as advertised. 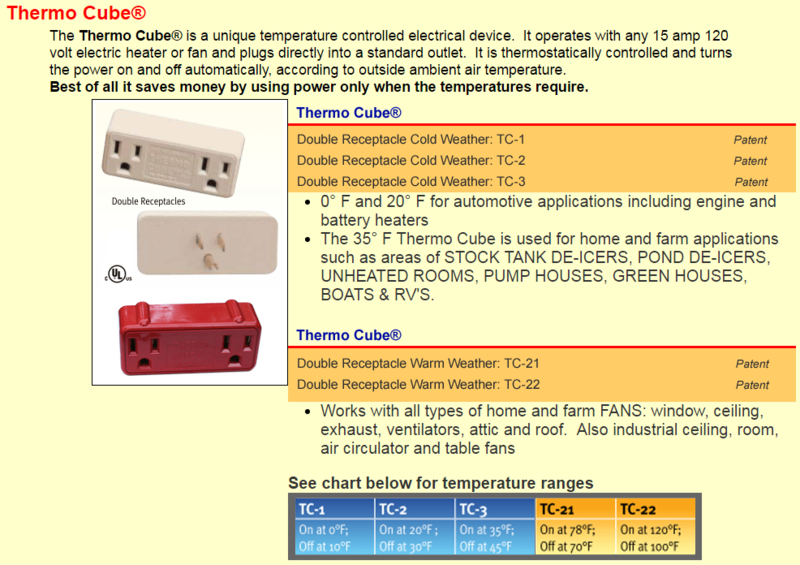 I have used the 35 degree thermocube for a few years. It has worked as advertised for me. I know people that have used these with a de-icer in their chicken coop water supply with good results.. Thanks, I think I'll use it for the heat lamp at the well and I won't have to worry about forgetting to turn it on. I got the TC-1 on at 0f off at 10f for my car plug in. Report to follow. Got a TC-1 on at 0f off at 10f and it works fine. Did put a light with it to see when it is on. I use one for the heater in the chicken coop. It works well. Reminds me of the blinking light wafer I put in the bathroom at work one time. I dont think they sell them anymore they went in the socket and the bulb screwed in after it. Mine was supposed to come on a 0f and off at 10f, on OK but off at 25f. They said send it back for testing. Cost about half the price to send it, might this Spring when I do not need it.